EN EL MARCO DE LA CELEBRACIÓN DE LAS BODAS DE PLATA DEL INSTITUTO SAGRADA FAMILIA. 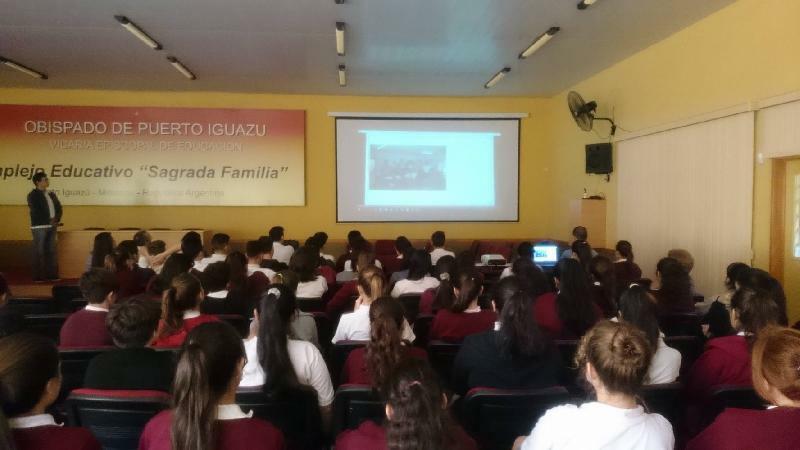 SE DIO INICIO A LAS ACTIVIDADES PROGRAMADAS POR LOS DOCENTES, CON EL OBJETIVO DE DAR A CONOCER Y RECORDAR UN POCO MÁS ACERCA DE LOS INICIOS DE LA HISTORIA DE NUESTRA INSTITUCIÓN. EN EL DÍA DE HOY, CONTAMOS CON LA COLABORACIÓN DE UNA MADRE FUNDADORA Y ACTUAL PROFESORA DEL INSTITUTO. LA SEÑORA EDITH BERENGUER, QUIEN RELATÓ A LOS ALUMNOS ALGUNOS DETALLES Y ANÉCDOTAS DE CÓMO SURGIÓ Y FUE TOMANDO FORMA EL ANSIADO PROYECTO DE UN GRUPO DE PADRES: CONSTRUIR UN COLEGIO DE NIVEL SECUNDARIO PARA SUS HIJOS.